Find popcorn for all your cravings at EC Pops! Chocolate! It’s the perfect dessert. It’s the perfect everything. At EC Pops, we happen to think it makes a pretty great popcorn topping. Don’t take our word for it, though, stop in to EC Pops on Main Street in Ellicott City, Maryland and try some for yourself! You’ll be glad you did! Okay, we know it may sound a bit odd that science says that you should eat chocolate-covered popcorn, but it’s true! There have been a whole bunch of studies done on humans’ reactions to different flavors, and the results of every sweet and salty test are that everyone loves sweet and salty. In fact, we often crave it! Come on in to EC Pops, and we will help you satisfy your craving! EC Pops has over 50 classic and unique popcorn flavors in stock and ready to go. Several of them- 13 to be exact- are covered in white, dark, or milk chocolate. Some are covered in TWO types of chocolate. The EC Pops chocolate-covered popcorn flavor line-up includes: Chocolate Covered Strawberry, Cinnamon Bun, Dark Chocolate Sea Salt, Finger-Lickin’ Butter Finger, Greg’s German Chocolate, It’s Your Birthday Cake, Magical Milk Chocolate, Nutty Peanut Butter, Peanut Butter Chocolate Drizzle, Strawberry Cheesecake, Whimsy White Chocolate Oreo, Wistful White Chocolate, And Zany Zebra! EC Pops is a gourmet popcorn purveyor owned and operated in Ellicott City, Maryland. We are proud to offer the best gourmet popcorn, locally-sourced sweets, delightful sodas, and lots of unique and Maryland themed gifts that the whole family can enjoy. Enjoy our popcorn wherever you are with bagged popcorn delivered straight to your door. If you’re ready for a taste of Maryland’s favorite popcorn, visit our charming storefront to taste it for yourself. 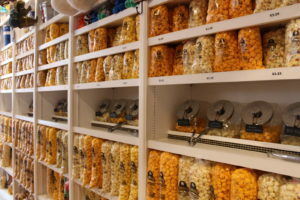 Our store is packed to the brim with your childhood favorites and modern twists on the classics including handcrafted gourmet popcorn, homemade fudge, Route One Apparel, and fun Maryland themed gifts. EC Pops always has at least 50 flavors in stock ranging from Great Garlic and Parmesan to Sea Salt Caramel — and you’ll get to try every last one! Have any questions? Give us a call at 410-750-POPS (7677) or email info@ecpops.com.